Foxconn Interconnect Technology Limited (FIT) (HKG: 6088), a subsidiary of Hon Hai Precision Industry Co., Ltd., and Belkin International, Inc. (Belkin, Linksys, Wemo, Phyn brands) jointly announced the signing of a definitive agreement under which FIT agreed to acquire Belkin for approximately $866 million in cash. Leveraging Belkin’s strength in research and development capabilities and the consumer products channel, FIT is expected to further tap into premium accessories and the smart home market. The transaction would also fuel the growth of Belkin’s portfolio of brands and products and supports further investment in research and development and engineering to expand FIT and Belkin’s presence in the U.S. and key markets globally. Belkin International and its family of brands will continue to operate as a subsidiary of FIT under the leadership of CEO and founder Pipkin and his executive team. Pipkin is expected to join FIT’s management team. FIT, which trades as FIT Hon Teng Limited, focuses on the development, manufacturing and marketing of electronic and optoelectronic connectors, antennas, acoustic components, cables and modules for applications in computers, communication equipment, consumer electronics, automobiles, industrial and green energy field products. Belkin International's product lines include Wi-Fi networking solutions for the home and business; mobile accessories for laptops, smartphones, tablets; home energy management, home automation and intelligent water solutions; plus, a broad range of connectivity and power products. Headquartered in Playa Vista, Calif., Belkin is a privately held company founded in 1983, and has more than 1,400 employees. 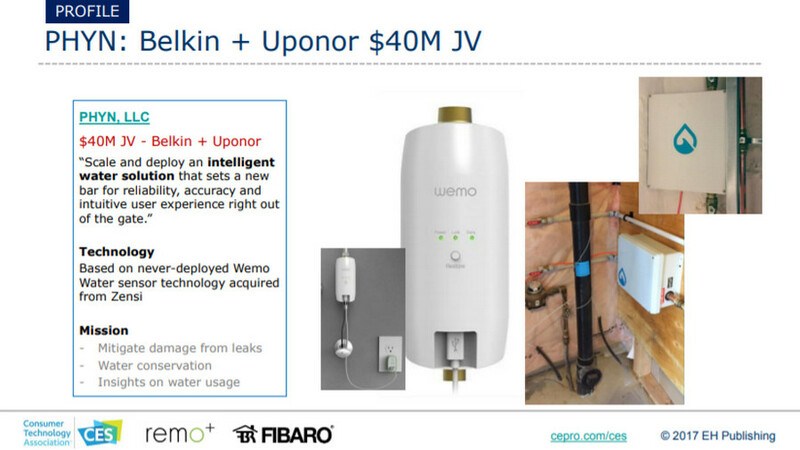 Last year, Belkin embarked on a $40 million joint venture with a company called Uponor, which specializes in water-monitoring and -management solutions. As we noted in our CES 2018 Ultimate Guide (pdf), water management is a hot IoT category these days. Worsening droughts throughout the country are spurring the development of water-conservation solutions. Meanwhile, insurance companies are working hard to mitigate huge damages caused by water damage from leaky pipes. Developers of water-related products and services are rising to the occasion. Water-related products will be discussed in our ISC 2018 Preview Webinar, featuring Trends in Security & IoT, on April 5. This article was originally published at CEPro on 04/02/2018. It was added to IoTplaybook or last modified on 04/02/2018.